PACKING: 35 KG. NET., 35.2 KG. GROSS, OUTER POLY WOVEN BAG, INNER 250GAGE POLLY LINE BAG. Roasted Chicory Cubes is unique square cubes of about 1-2 cm. 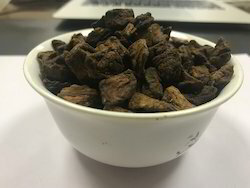 This Roasted Chicory Cubes are uniformly Roasted and on further milling of this cubes make Roasted Chicory Powder which is suitable with filter coffee. retain on 2mm wire mesh. Above 18mm would be 5% and below 2mm size would be 5%. Average 18mm to 2mm size is 90%. Golden brownish in color with maximum moisture of 4-6% and extractability of 63-66%. We can supply various grind size and roasting as per your specifications. 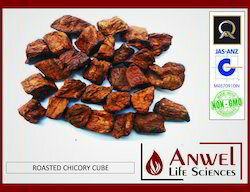 The Graded Chicory Cube are roasted in roasters. After roasting it is placed on a cooling tray for cooling. Our master roasters are very for thoughtful and attentive about the rich aroma and taste of the roasted chicory cubes. Finally it is packed in 35 Kg. inner poly liner, outer HDPE woven bags. We are instrumental in manufacturing, importing, exporting and supplying a supreme quality range of Roasted Chicory Cubes. - Extensively Used in various types of nutraceuticals food products & others. Roasted Chicory Cubes offered by us are obtained by subjecting high quality dry chicory to a heating process. To obtain a good chicory crop, the soil should be fertile, easily workable and deep. Semi black cotton soil/sandy lom soil is ideal soil type for chicory that is found in Jamnagar, Gujarat.